Thank you for your blog post today! I, too, have a small kitchen with limited storage space. I love to collect different dinnerware sets, bowls and serveware! It is truly my passion. 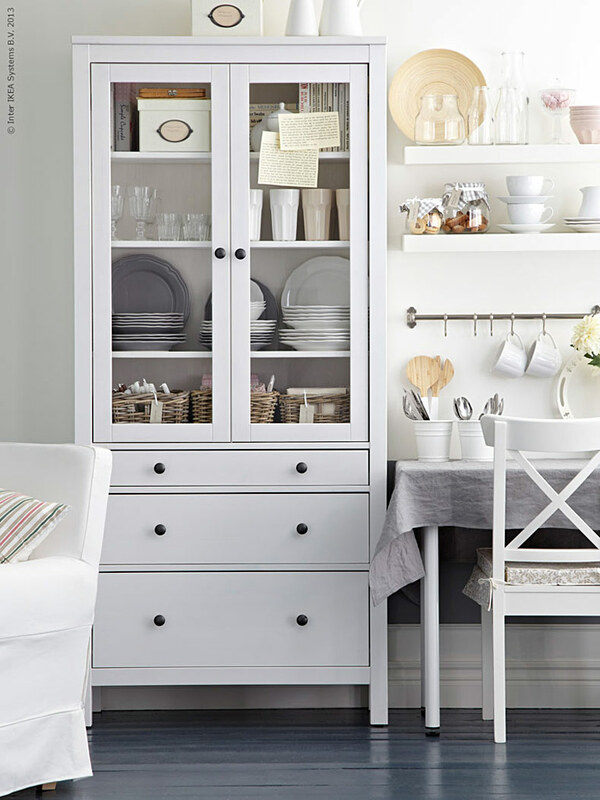 I have, through the years, tried to find the most creative storage ideas for all my treasures. It is truly a challenge, but it is also worth every effort! Thank you for all the beautiful pictures of the most gorgeous china storage. It was a true treat to see all of the beautiful pictures! I was actually looking for some storage for plates for my dining room. I have a buffet, but it has been filled. I would love two vintage corner units. Have to start looking around at estate sales. I have a collection of antique blue and white plates from my husband’s grandmother. and I love collecting white pitchers, hobnail items too. Would love to have a place to show them off. I have an old doctor’s medicine cabinet that houses my fiesta ware, all different colors. I enjoyed seeing how they are placed. I have long wanted a cake stand and see where I can put on now. All these pictures give me the feeling of home. My mom loved to practice hospitality and as a young girl g my job afterwards was putting away the dishes and stemware back in our family hutch I have the cutest two handled sugar bowl with little painted pink flowers that somewhere in my grandparents home lost it’s lid. 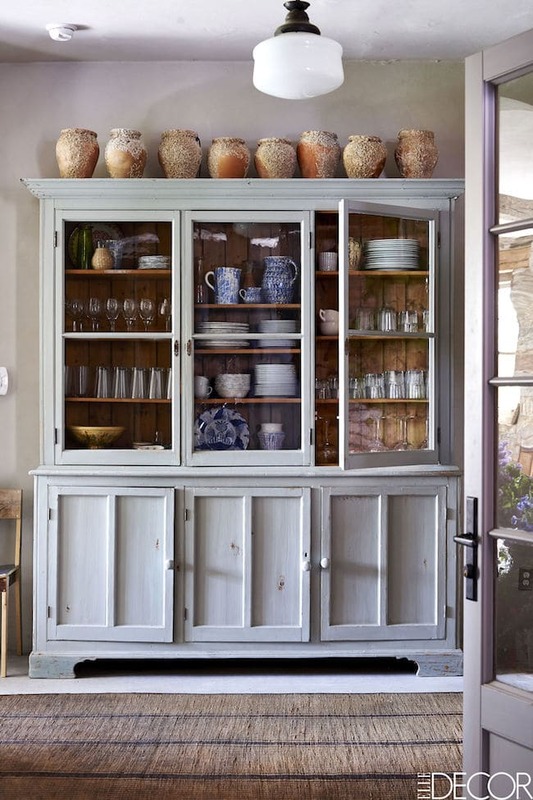 It steals the show wherever it is stored and looks best with spring blooms stuffed inside! Mine are in the basic buffet with hutch stash. I love dishes! I do like storage that’s closed. Not only good against dust, but not everything I own is worthy of being on display. In our house, it seems we never have enough storage. We have only one set of dishes–fine Limoges that gets used every day–but still as avid cooks we have lots of stuff. In our rentals, one has the gigantic French dream kitchen, with not only plenty of cupboard space but also a built-in cupboard called a confiturier (a place to store pots of jam). 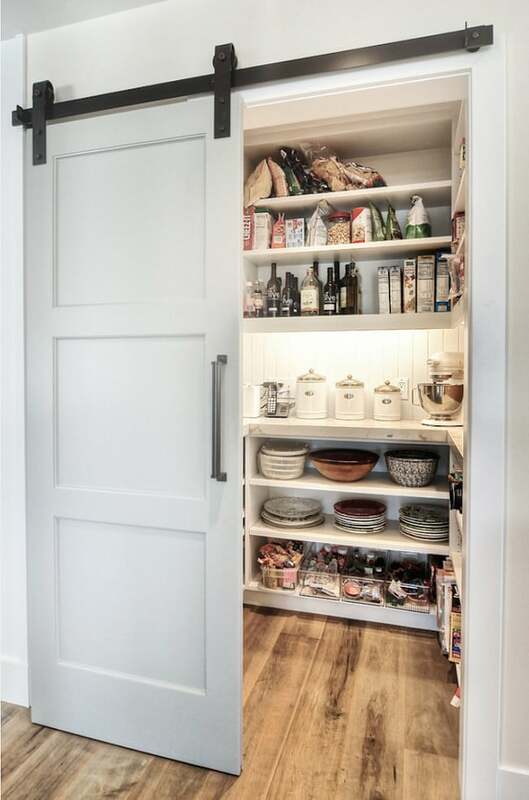 And a big pantry. That was really too much for a vacation rental, so we put a sauna in it. Too bad I couldn’t take the pantry home with me. In my previous home I had room for my Big Green Monster (an antique cabinet similar to that photo from Elle but obviously green!) in my eat in kitchen and it was perfect for storing all my dishes. Unfortunately in my new home, the Big Green Monster didn’t fit anywhere in the kitchen, dining room, or living room so it’s been relegated to the guest bedroom, where it stores sheets and guest towels. I had to purchase a much smaller china closet for my dining room, where I store my crystal and glasses. It’s ok, it worked out, but I really can’t have multiple sets of dishes, although I’d love to. There’s just no room to store them! 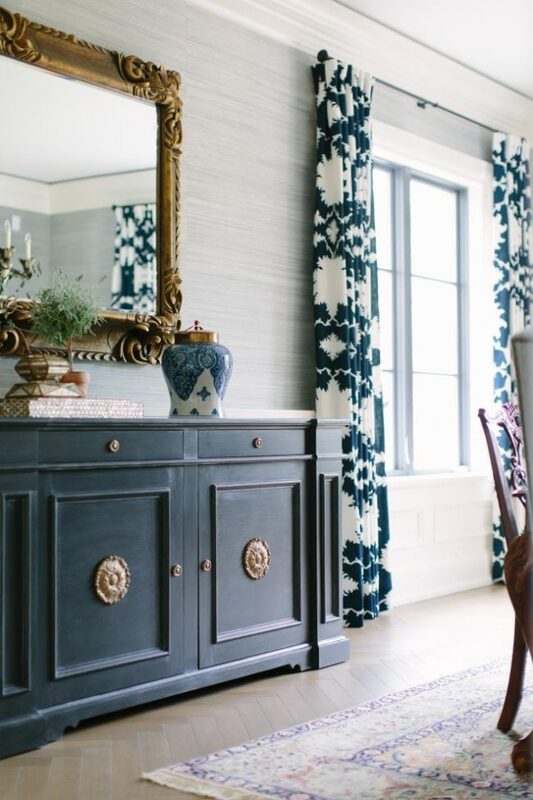 Great inspiration here, love your blog and your home! 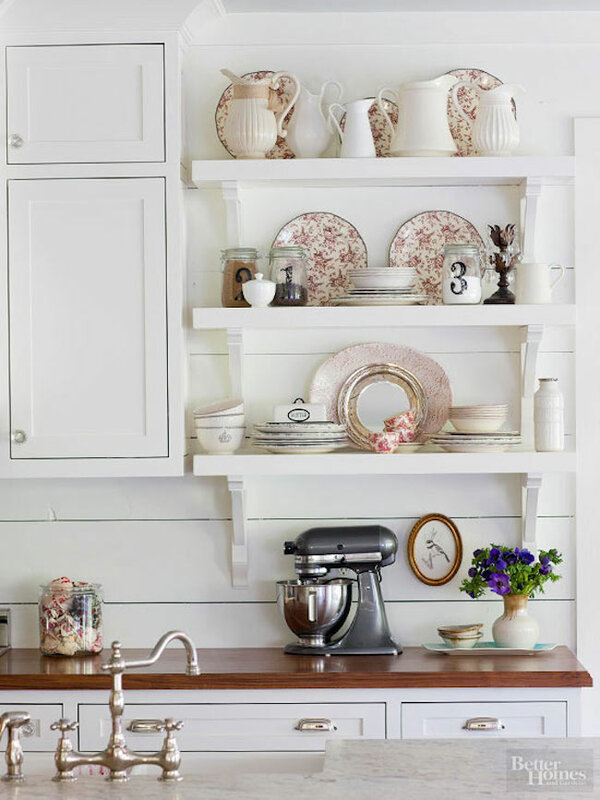 I surely have a compulsion or obsession with having “things in order” because while all the cabinets are surely lovely and the contents beautiful as well, it is all the neat stacking and pretty piles of organized goodness I am drawn to! Be still my heart! Like “pretty maids all in a row”! I think that for whatever reason, dishware of all types and values has become popular again. 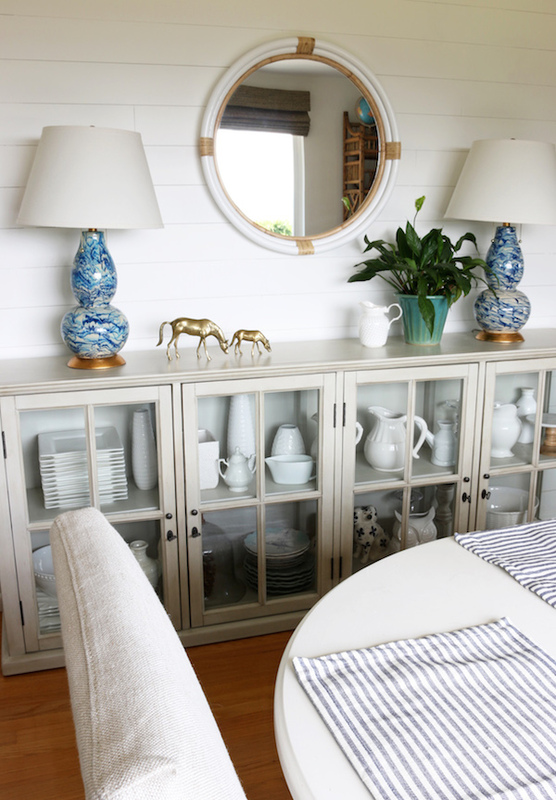 Mixing and matching new items is much easier than worrying about breaking or replacing grandma’s china, so with all the choices out there, those of us without sentimental dishware can create our own. Then, as you’ve pointed out, where do we store it all? 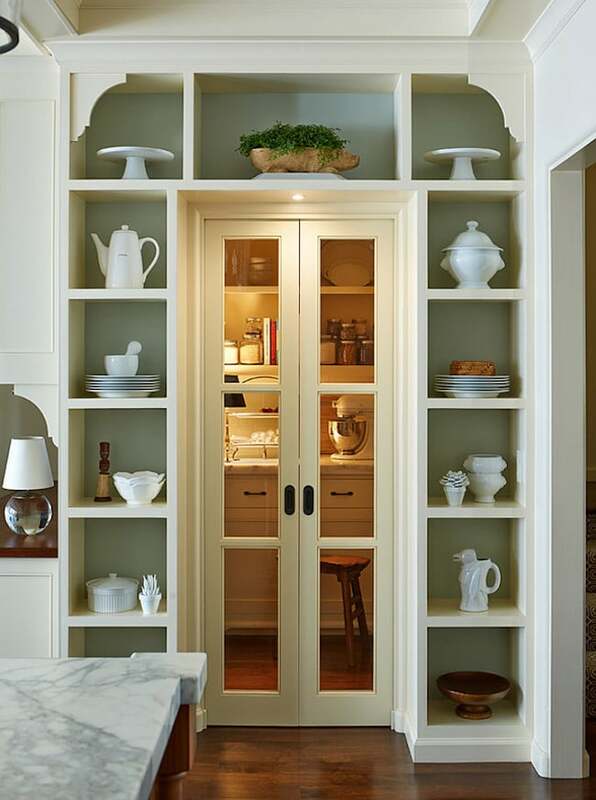 New home builds are beginning to go back to the butler’s pantry idea but those of us living without a butler’s pantry must get creative and I think you’ve done a great job with your stand alone shelves and cabinets. 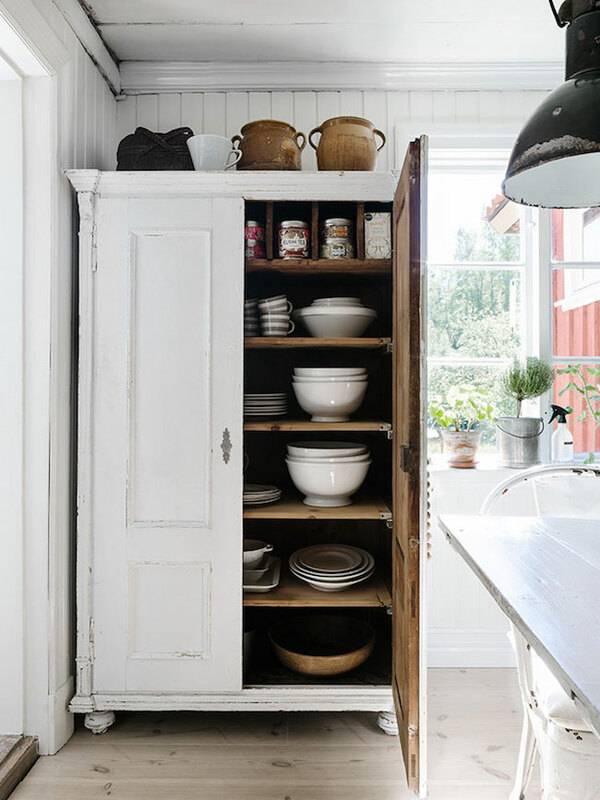 You’ve shown that it isn’t necessary that open storage of beautiful and interesting dishware always be within the confines of the kitchen – which is a casual idea that I absolutely love. 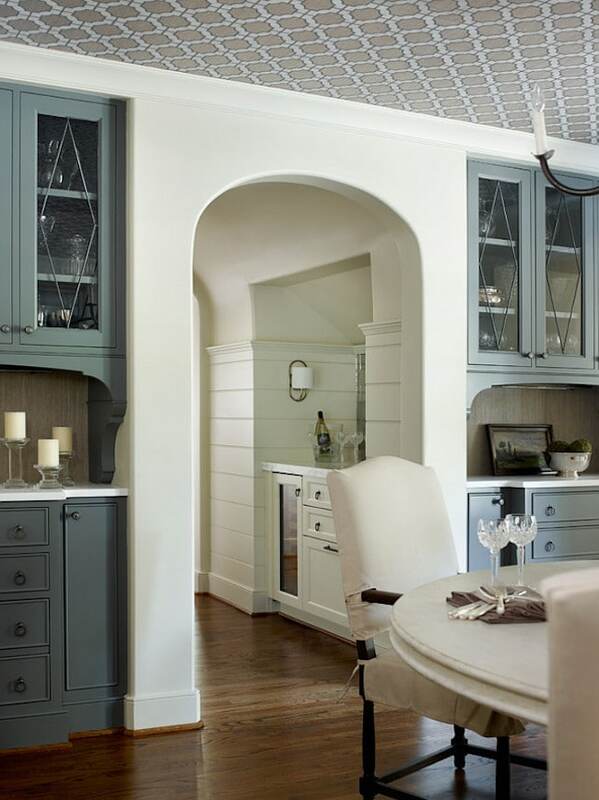 I love the idea of large bowls, platters, serveware, etc connecting a dining room or unused hallway to the family vibe of a kitchen. Thanks for a post reminding us to look for a place other than the kitchen for our pretty dishware. 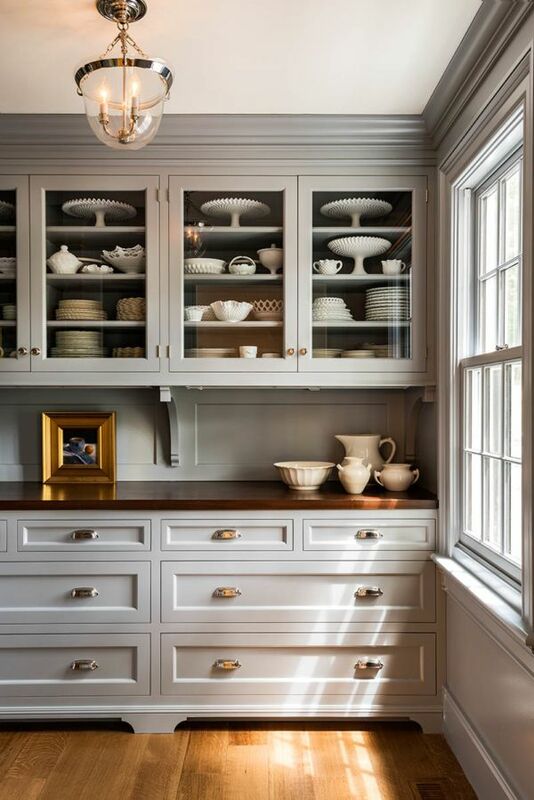 Fortunately, I have enough storage in my kitchen cabinets and dining room buffer for my everyday Fiesta ware and my “good” china, but I also collect midcentury china, American Modern by Russel Wright. When we moved into our new condo, there was a big blank wall in the kitchen, so we had a remodeler friend built a wall unit that matched our white kitchen cabinets. It now houses my growing Russel Wright collection on open shelves, and it also has closed cupboards that hold cookbooks and odds and ends of unmatched dishware: platters, pitchers, and small bowls for serving. I love it! I absolutely loved these beautiful photos! I too love dishes but have limited storage. A couple of years ago I purchased 2 Safavieh Brodi bookcases to replace the assorted antique pieces that held dishes in my dining room. 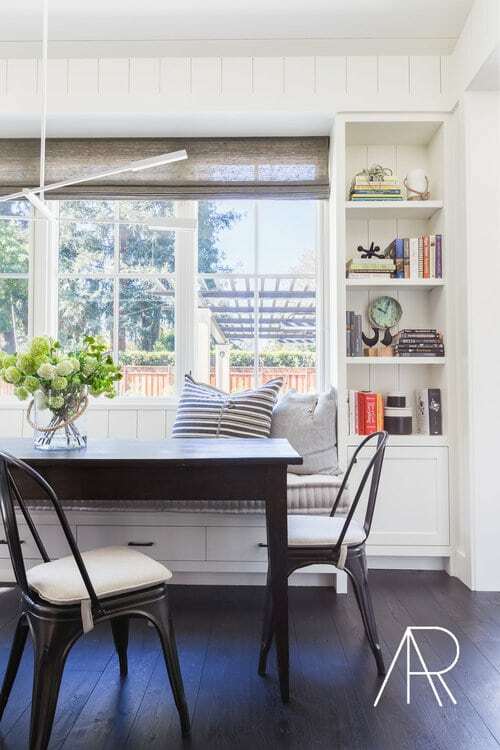 The open shelving immediately updated the room and made it seem larger. They beautifully hold and display the 36 place settings of Pfaltzgraff Yorktown dishes I’ve accumulated since registering for them as a bride 40+ years ago. At that time they were $5 for a 5 piece place setting. 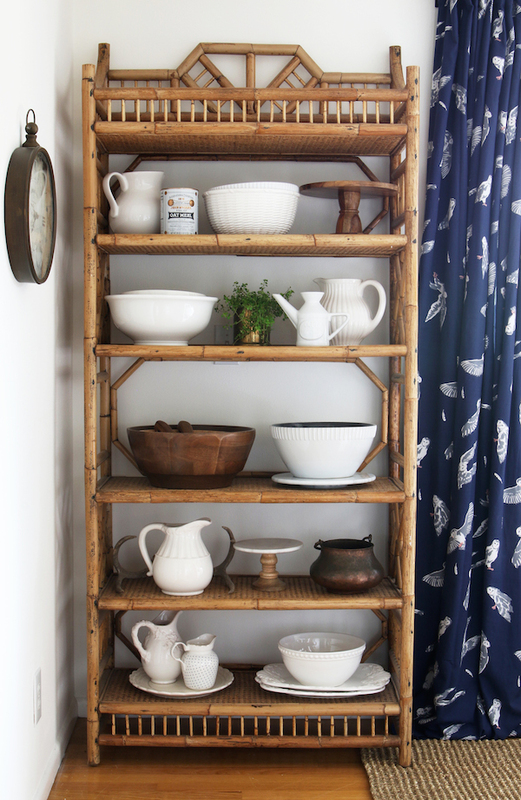 I’ve loved what you’ve done with the rattan shelf in your new home and routinely search Craig’s List for one. I was thrilled to find the small marble top cake pedestal recently. Maybe someday it will take residence in my own rattan shelf. In the meantime it’s on my island and I love it. I LOVE dishes! If I had an unlimited budget and storage, I’d have dishes for every occasion! But since I currently have neither, lol, I don’t get too carried away. :) I have Fiestaware, vintage and new, that I keep in my kitchen cabinets and also in my buffet. I love the colors! I also love just plain white dishes, but do not own any yet. Stored away in my attic I have my mom’s blue and white Currier and Ives. They aren’t fancy, but they mean a lot me because they were her’s. 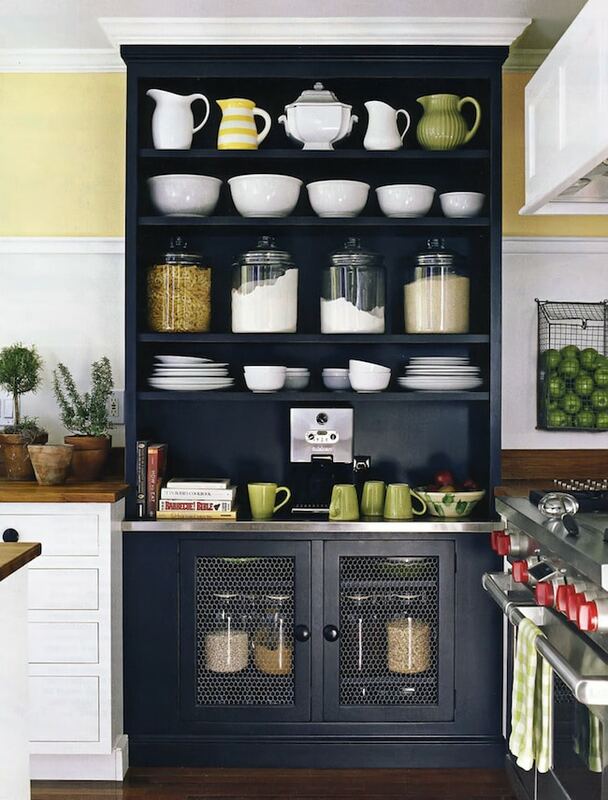 I just saw that yummy large cupboard in Elle Decor earlier today. I have an old postal sorter which makes my white ironstone dishes look pretty terrific, I think. I’m inheriting some soft red transfer ware dishes, + I was thinking of hanging a ton of them as a statement wall, if I am courageous enough. Thanks for all of the inspiration! I saw so many inspirational displays on my trip to the Magnolia Market in Waco this past weekend as well. So much styling to do–so little time ;-). I keep my overflow dishes in a corner hutch that my husband built specifically for my need of more storage. 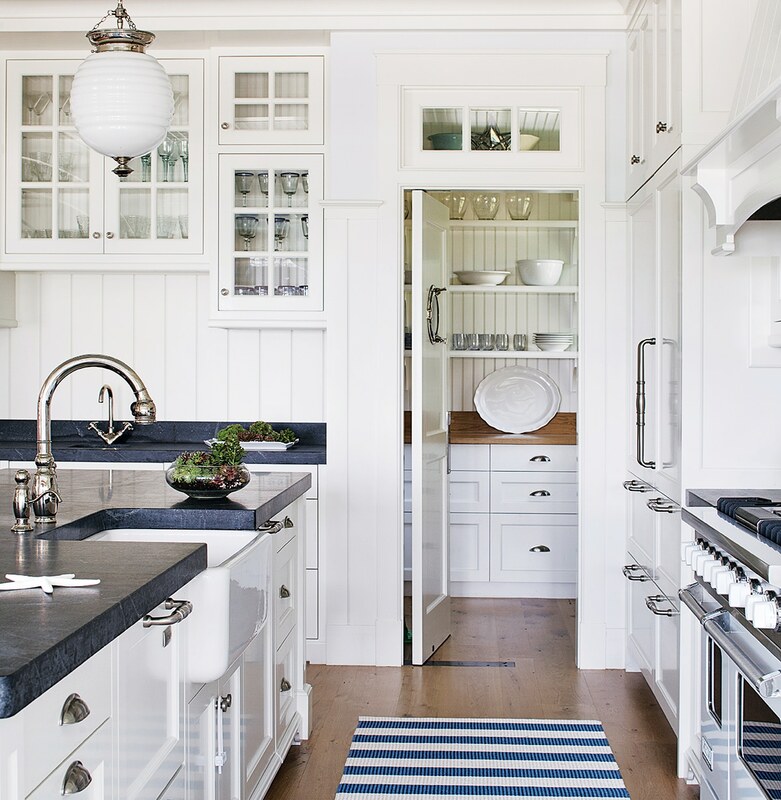 It is painted a lovely shade of blue and compliments my small white kitchen. I store my extras in my Grandmothers hutch which I have had for the last 30 years or so. It’s matching dining table and chairs are long gone. When we moved from a larger house, we had to choose between two hutches….which to keep? We could have kept the newer, larger one that was in our wine room. But instead, we opted to keep the one that is our family “heirloom”. Because our current dining room is quite small, we need much smaller furniture. The hutch fits, but our table was the wrong color and the chairs were just too big to fit the space. I finally found a table and four chairs that I hope will work, fingers crossed. They should arrive in about 2 weeks….anxious! I’ve had my eye on a hutch since Nov. at an antique store in town. The cost was too much for me, but I would check the price every time I went in to see if it had been lowered to the price I had in mind. Last week I couldn’t believe my eyes when I saw it had indeed been lowered to the exact price I was wanting! So excited to bring that sweet thing home. I can’t wait to paint her (a pretty white-any ideas?) and then I plan to store my china and tea cups and white plates on her. Notice I say her-ha! I wonder if I should give her a name? lol. My kitchen is about 6’x10′ – so it’s small. I’ve had to reduce the number of dishes I owned and keep my non-everyday dishes in my hutch and buffet. I love dishes! I try to look at my small kitchen as a reminder of what I really need and what is extra. Dishes can tell a story and help create a feeling with a meal. My babies are little, but they already understand how dishes and presentation make a big impact with meals. I’m actually going to screen shot this entire post so that when I buy my own house, THIS. EXACTLY THIS. Is what I will show the builders. / try and get my uneducated-in-the-world-of-interior-design brain to recreate!! Thanks so much for sharing and so happy I found your blog! Funny that this is what today’s post is about! I just commented on “Home is where the boat is” blog this exact question because of all the beautiful tables capes she does! I have a thing for glassware, and I have three full sets of dishes (Spode Christmas tree serve for 16, Vintage Sheffield serve for 22, and my everyday Longaberger heritage red serve for 16) at my house and then I have the Moss Rose serve for 32 because both of my grandmother’s had it- I keep this in my mom’s china cabinet. It really is a tad tricky! Thankfully I found a server on Craigslist that matches my LR and DR set from EA and it is now holding all the Spode. I’m curious to hear/see what others do! Oh I think we could all be dish friends! I have several sets of blue and white, a collection of red and white transferware, and a collection of brown and white transferware too, as well as several sets of glassware. 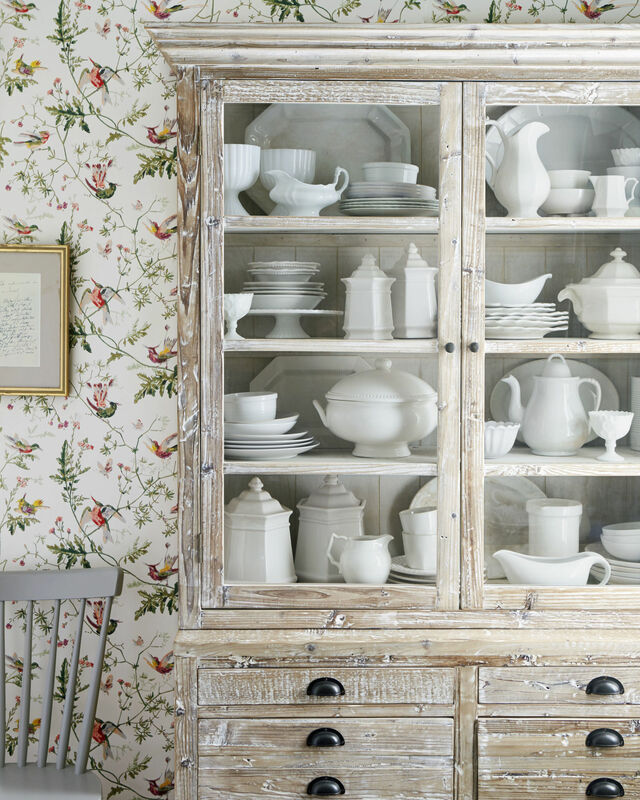 Recently I’ve been purging and decluttering and sold my two antique buffets that held many of my lovelies. My sweet hubs added sturdy shelving to our entry hall closet, so now I have a “dish pantry”. Our winters are so mild here we hardly used the closet to hang coats so it was found space. I painted the shelves white, and organized all my dishes in there, and the bonus is it is adjacent to our dining room. I love seeing them when I need them but they stay clean and dustfree, and my dining room is roomier and uncluttered. Thanks for your beautiful posts. I’m new to your blog and can’t wait to spend some time looking at all your ideas and lovely photos of very do-able projects.